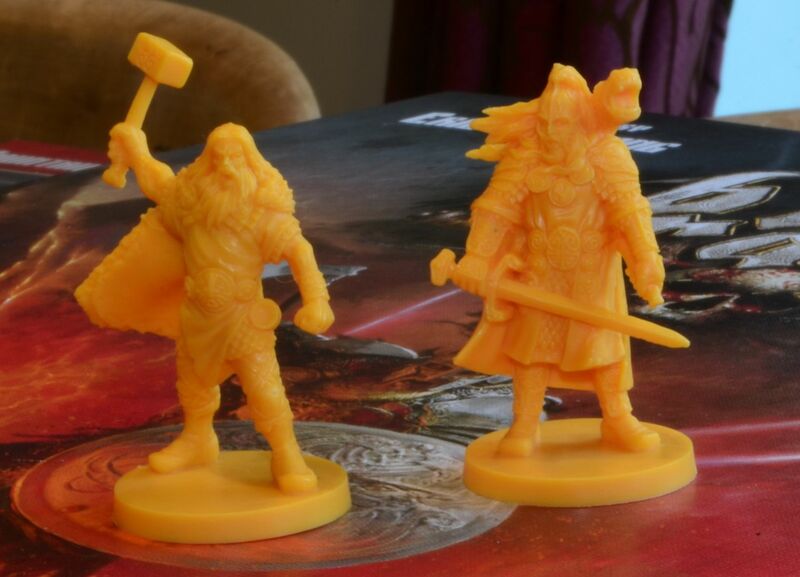 A game of Vikings, monsters, Gods and Ragnarok. For the princely sum of $75 (about £50) I decided to back this. Rather than list all the contents this is what the final pledge manager delivered. I decided not to add the 5th player expansion. 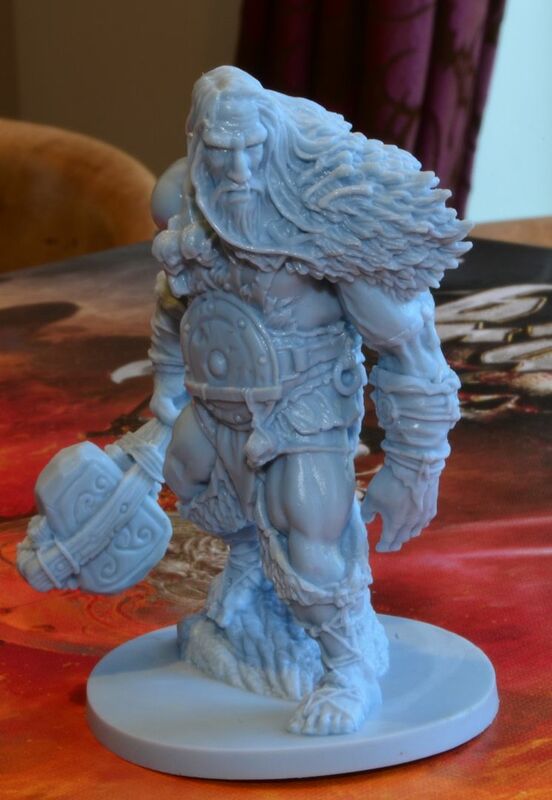 This is my favourite the Hill Giant - standing very tall. 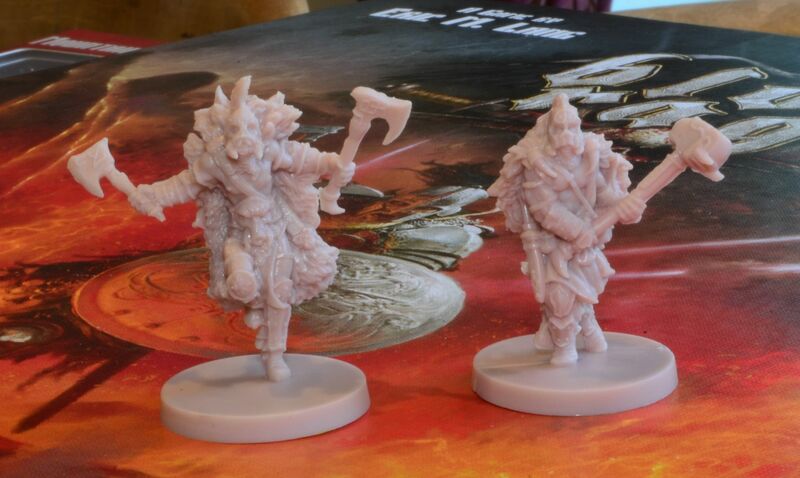 Loads of minis that look perfect for horror and pulp games﻿ - the monsters look great ! The pieces are all loose so various permutations can be created. 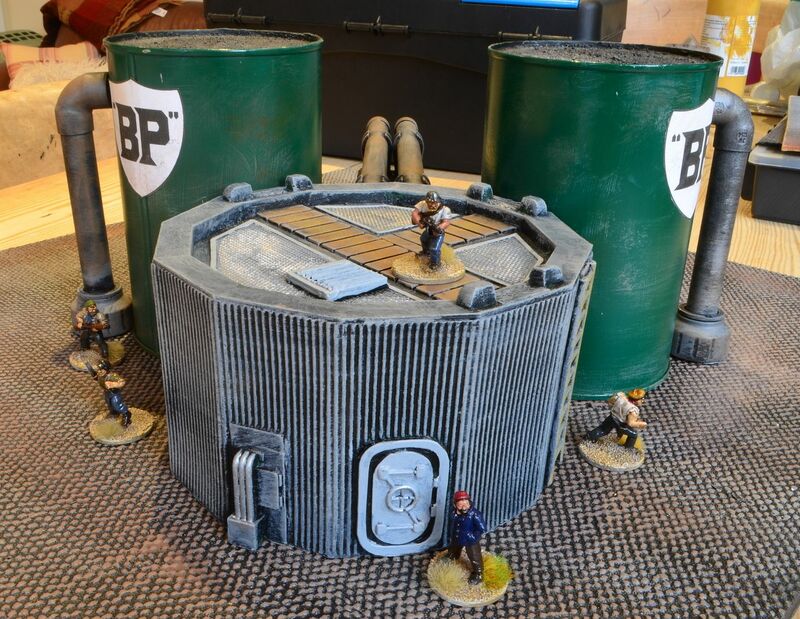 Aside from the grey resin building (boght from Tablescape) the rest are just old bits of piping and tin money box cans. 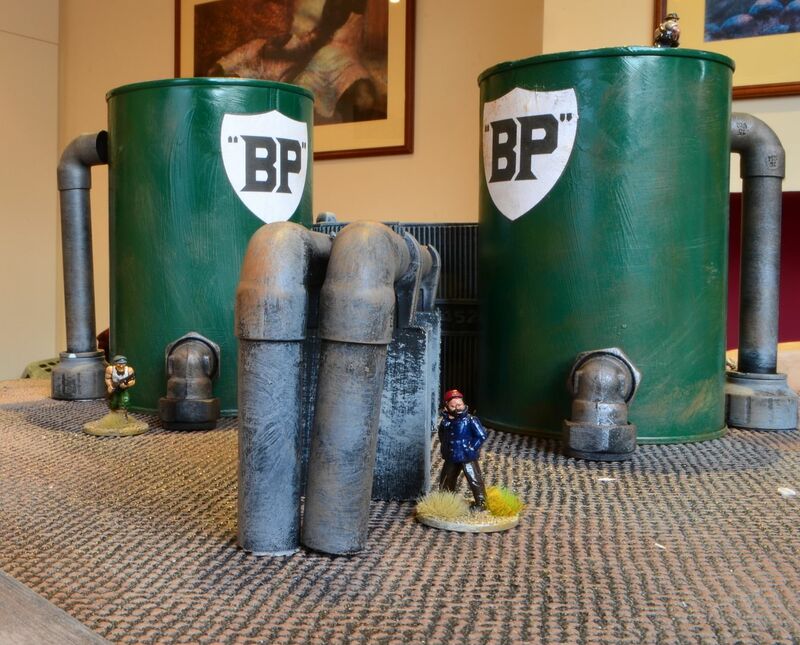 The tops of the cans have been covered in glue and sand then painted black to give an asphalt top. 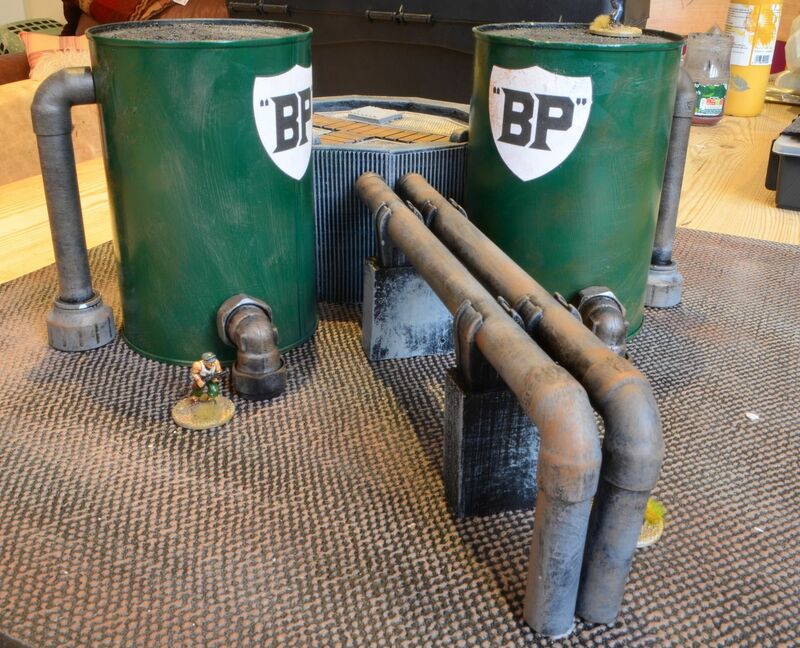 The BP logo is from the 1930's and seems to work quite well on the green sprayed cans. 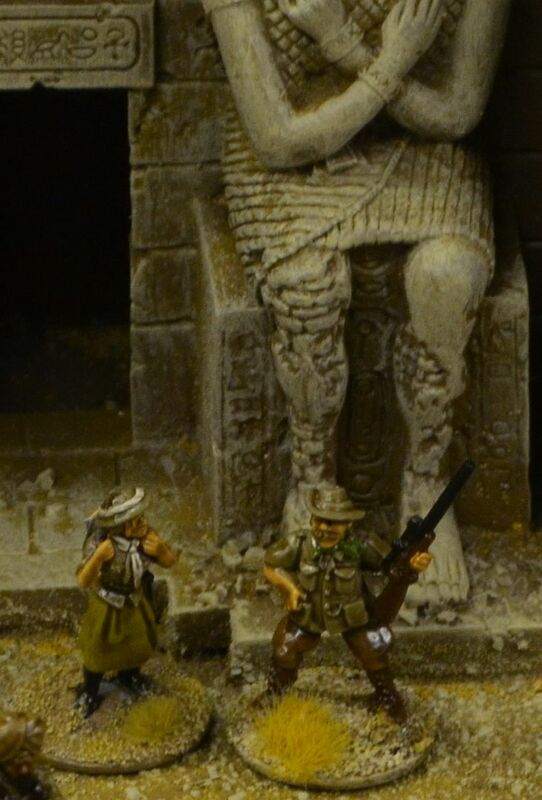 The figures are all from the Pulp Figures range. Things are pushing on with my game for BLAM in which the dastardly Nazi's are sure to appear. 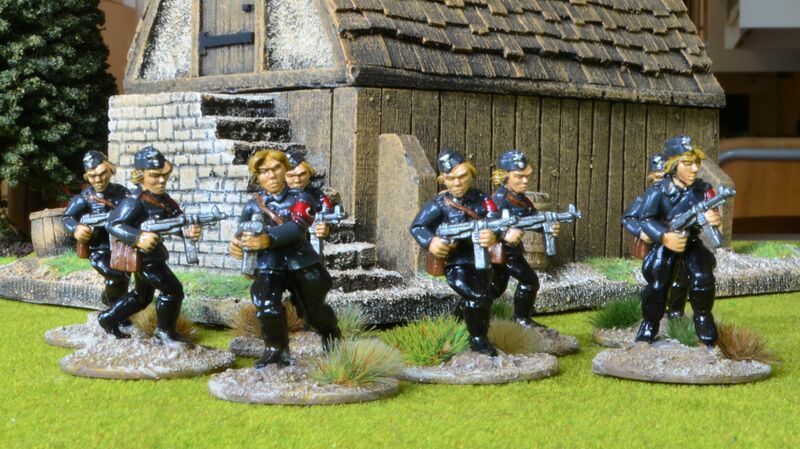 It just so happens that whilst at Colours this year I picked up a few packs of Bob Murch's excellent Pilp Figures - The She Wolves (packs 1,2 & unit builder) plus a few Nazi Generals. Real life keeps getting in the way of the hobby, the work (and more travelling) add in a heady mix of World Cup Rugby , a daughter learning to drive, and visiting universities for same said daughter and my project for BLAM has been seriously curtailed. Enough of my complaining. Actually quite a lot has been completed since I last updated the blog on this project so here goes a short pictorial summary. 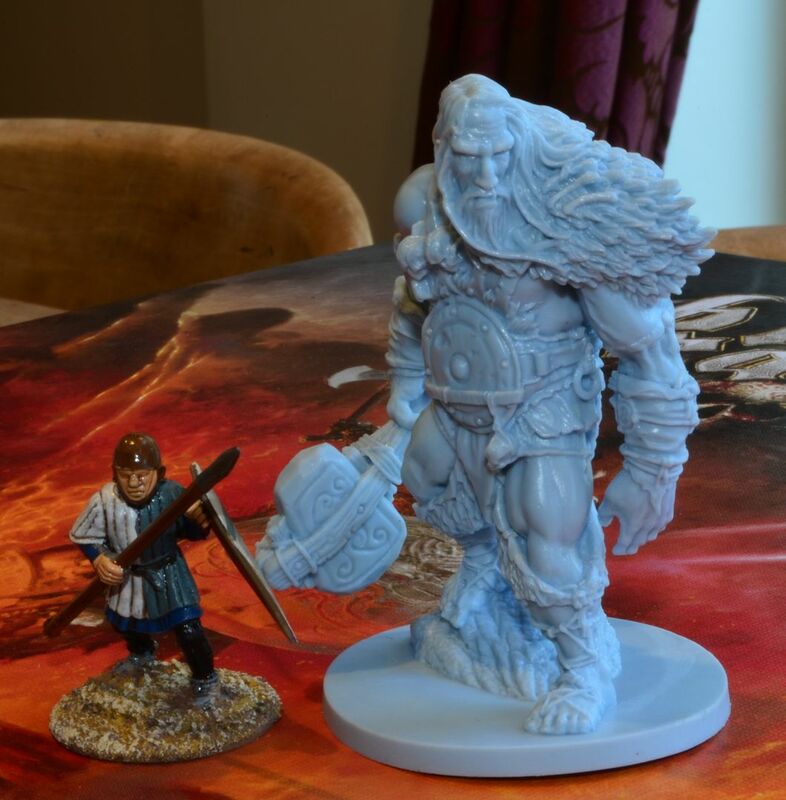 If you have been following this Blog you will know that once a year I meet with a group of like minded gamers from the Lead Adventure Forum for a weekend (3 days of beer and games). This year 30 souls descend on my local pub !! 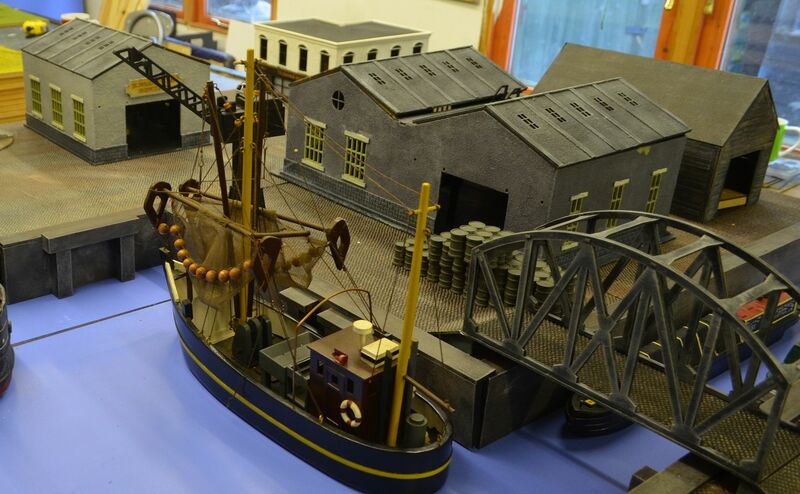 My project this year was to build a 1930's Port - I plan to use this in my VBCW and Pulp games. I started back in June ( gosh that surprised me only 12 weeks ago ! 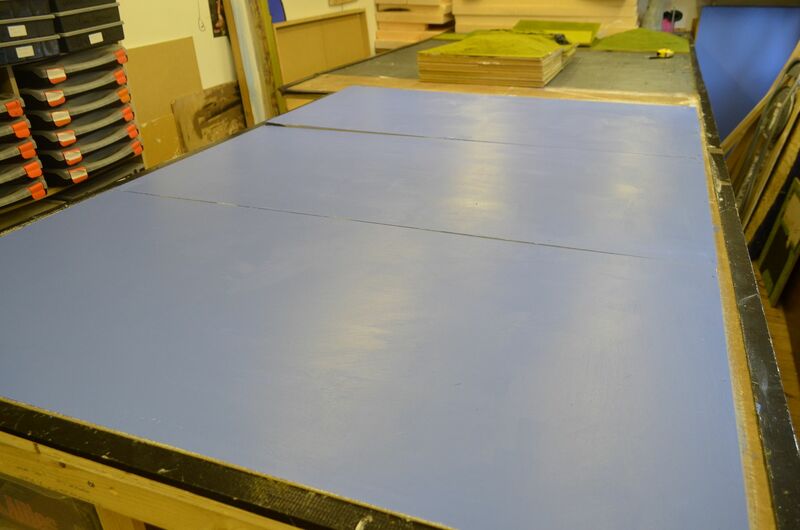 ), and with the numbers turning up we are constrained to use tables no bigger than 4ft x 6ft. 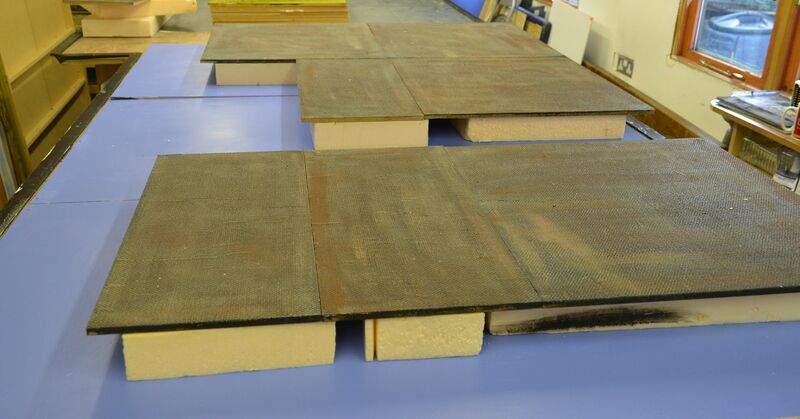 The dockside walls were built using precut 9 mm MDF and topped with a ridge of thin wood stripping. 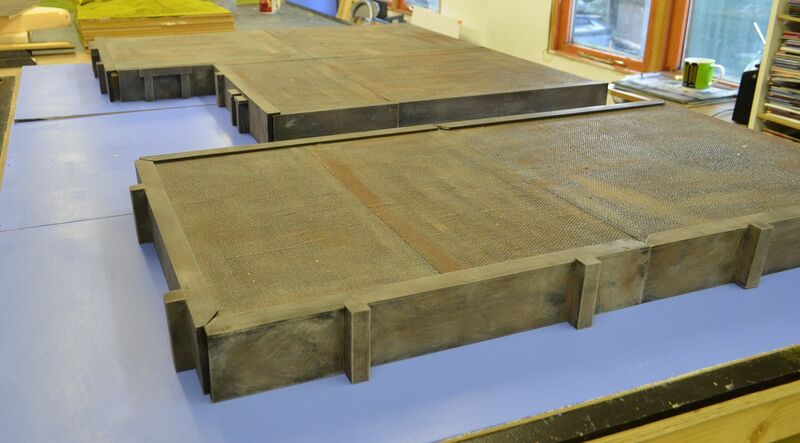 These were painted black then dry brushed up greys and browns. The mooring posts are some old bits of timber and jenga pieces. They are quite weighty so will not move around too much. I am quite pleased with the way these have turned out. The advantage is of course that I can reconfigure the shape of the dock in many ways. 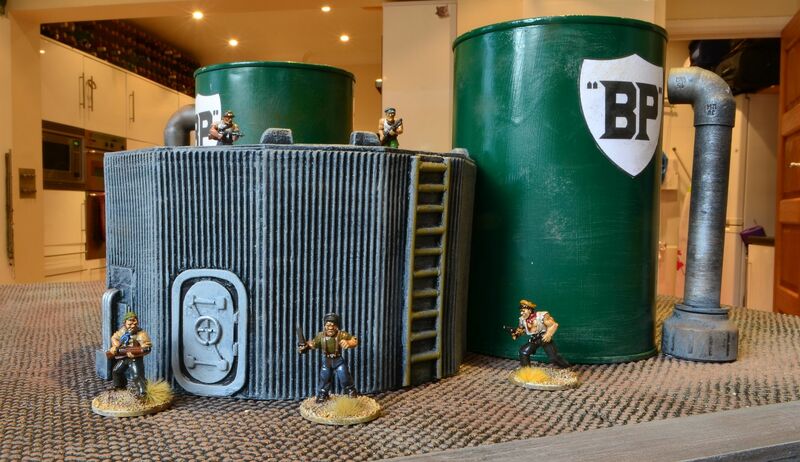 The storage tanks are £1 money boxes from Poundland sprayed green - these will be dirtied up. 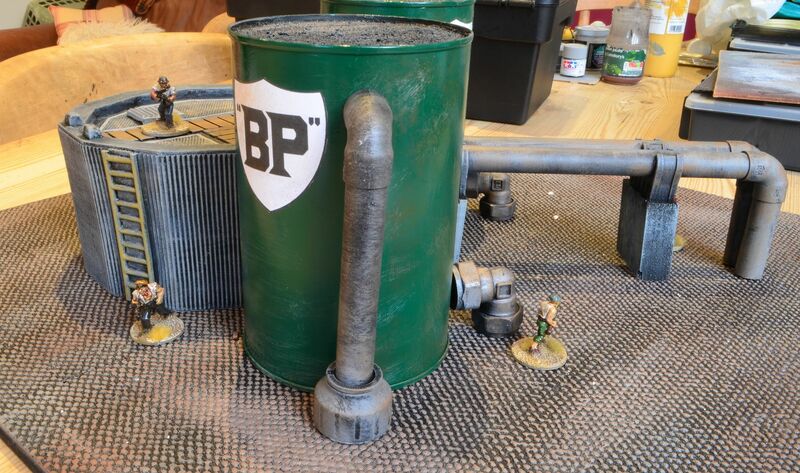 The pipework, valves etc are just 15mm plumbing stuff sourced from B&Q. This all needs finishing. But you can see the work in progress. The Bridge crossing the canal is a Warbases box girder bridge bought at Colours - for £14 I was really pleased and wanted another. 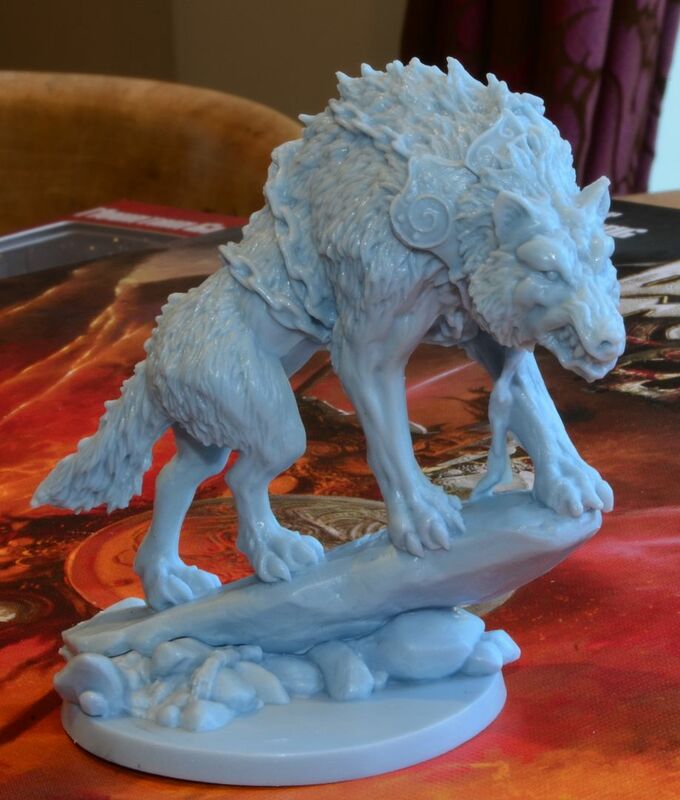 Alas it is no longer on their website so I have ordered a different one from Sarissa. 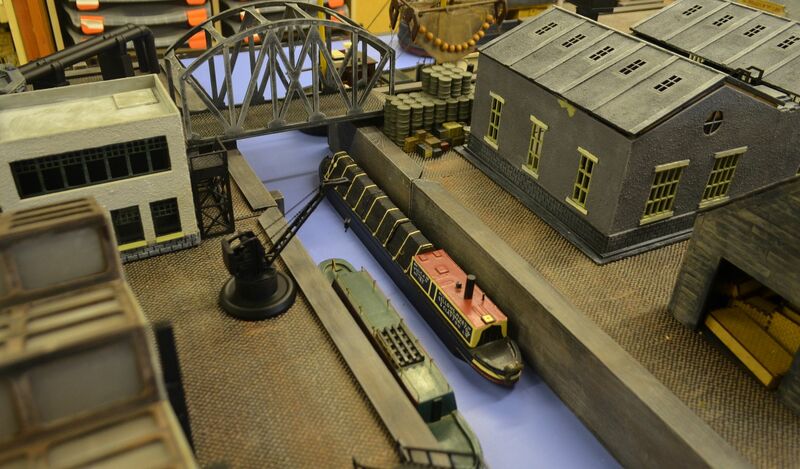 There will be two bridges crossing the canal to aid playability. You can see the finished factory and factory buildings from Sarissa behind the refinery. These are more or less finished. The Canal separates the industrial zone from the warehouse area. I bought the barges ages ago off ebay - they are cheap tourist gifts. The warehouse area needs the most work - doors still need to be fitted to the buildings. Goods still have to be painted and other paraphernalia added. 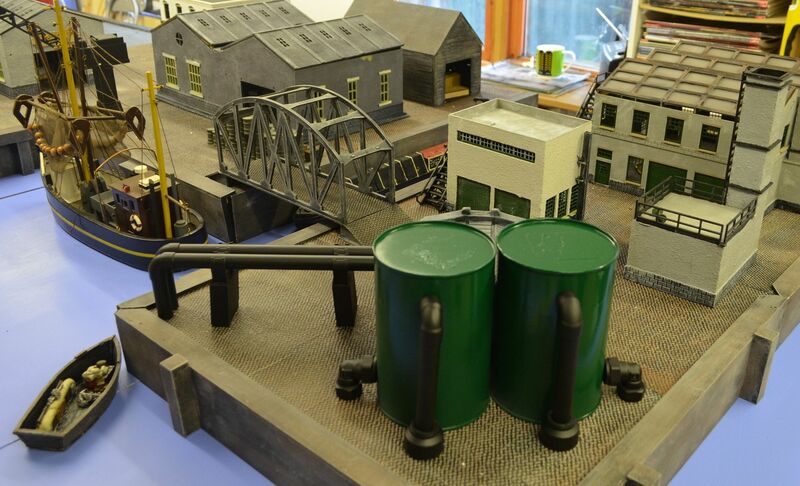 The black crane (still to be painted) was originally a Thomas The Tank Cranky the Crane toy with a new arm added. I didn't have much time to create a full back story on this campaign and to be frank the table was a rather rush job. 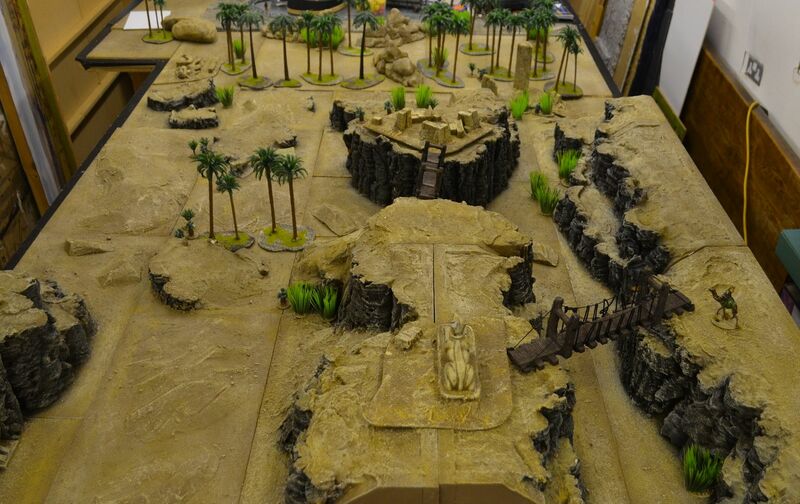 Out rolled the desert boards. The Nazis would land on the banks of the river (the top part of the picture) with the British PITH Agents starting in the bottom left...the tomb entrance serving as a proxy for the Behistun inscriptions. The clock has marched on - it is 1938. 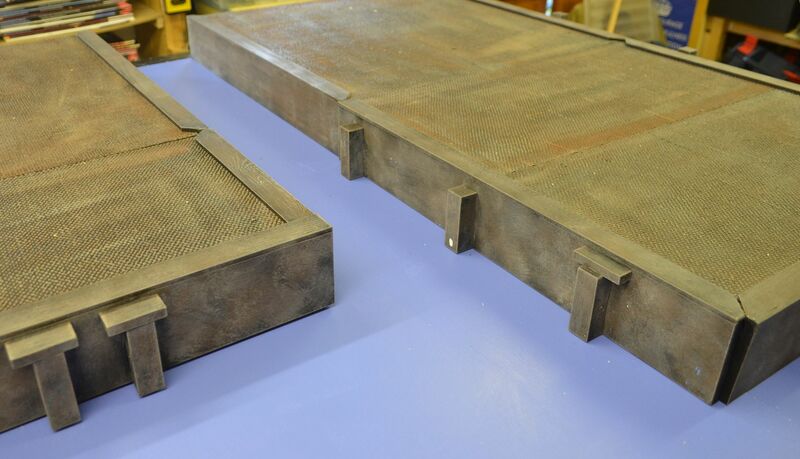 With three pieces of the scales now in the hands of the Nazis both sides have been scouring the libraries, museums and histories for clues of the whereabouts of the remaining parts. Only recently the Germans conducted some rather unusual investigations in Persia...apparently they used a balloon to take pictures of the Behistun inscriptions. Could this be connected.? The Nazis believed that the ancient Persian empire had been built by ancient Aryans. Hans Friedrich Karl Gunther, a professor of social anthropology, published a book in 1922 claiming the Persian empire was a nordrassische Schopfung, or “north-racial creation,” emerging in the North to conquer vast lands in Asia around 2000 BC. Wust had come to the attention of Himmler thanks to his theories that the ancient Sanskrit Rig Veda text provided evidence of a Nordic race sweeping out of Europe to colonize Iran, Afghanistan, and northern India during antiquity. Himmler placed Wust in charge of the Ahnenerbe in 1937, where he strove to sideline individuals whom he saw as cranks, such as Wiligut, and upstarts, such as Gronhagen. Wust hoped to organize an expedition to Iran to investigate the Behistun (or Bisutun) Inscription, located on a mountain of the same name in Iran’s Kermanshah province. The inscription, carved sometime from 522–486 BC, discusses the life and ancestry of the Achaemenid emperor Darius I, or Darius the Great, who described himself as an Aryan. The inscriptions had been carved into a cliff face with scaffolding, too expensive for Wust to recreate, so he proposed he, his Iranian student wife, a photographer, and an experienced mountaineer be sent via balloon to take pictures. With the outbreak of World War II, the scheme was permanently shelved. In our background the Germans did undertake this expedition but the local wily Arab leader in the region knew of the interest in these runes once he heard the British were also interested in mounting an expedition. Siezing the opportunity to earn a bit of cash he hacked off some of the heiroglyphics willing to sell to the highest bidder. These missing runes in turn would lead our adventurers across the board to another Arab who had somehow mysteriously come to hold the staff.. Both players were informed of the importance of this area - the British still had to complete the translations whereas the Nazis had indeed completed most of this themselves. They just needed the missing pieces. These they knew were up for sale. Keen to get a march on the expected Nazis, Grainger Stewart lead his Pith agents and accompanying Sikh Troopers into the ruins of Behiston and hastily translated the inscriptions. The party set off towards the desert camp, perhaps these locals could explain why they had desecrated the runes?? Mean whilst Major Gruntz had also landed his men (including Kapitan Vier). With the fortune of already knowing the translations there next objective was to better understand the texts located at the fallen pillars near the river shore. However a cryptic message from a local guide revealed that the Bedouin camped in the desert might have something interesting to sell. 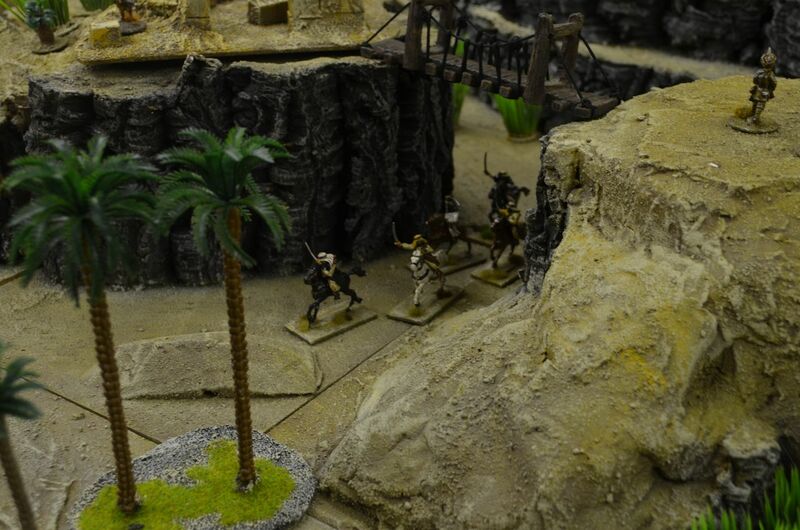 Gruntz with his men decided to push on to the Arab encampment. As they approached they could see Grainger Stewart moving forward. 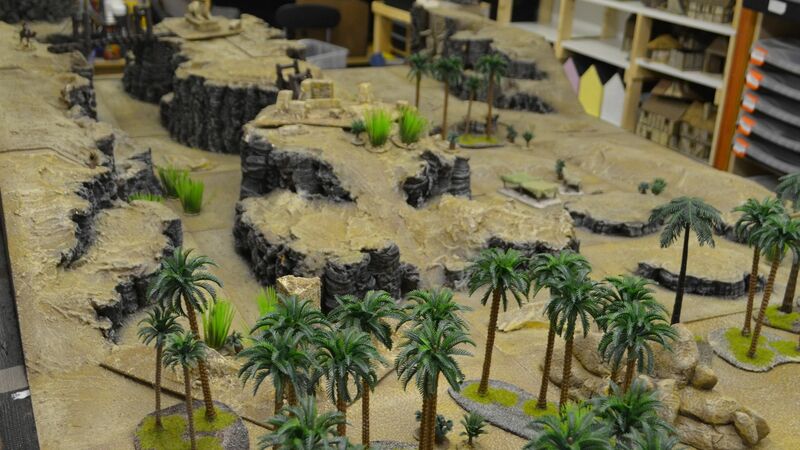 A furious exchange of fire erupted across the desert. 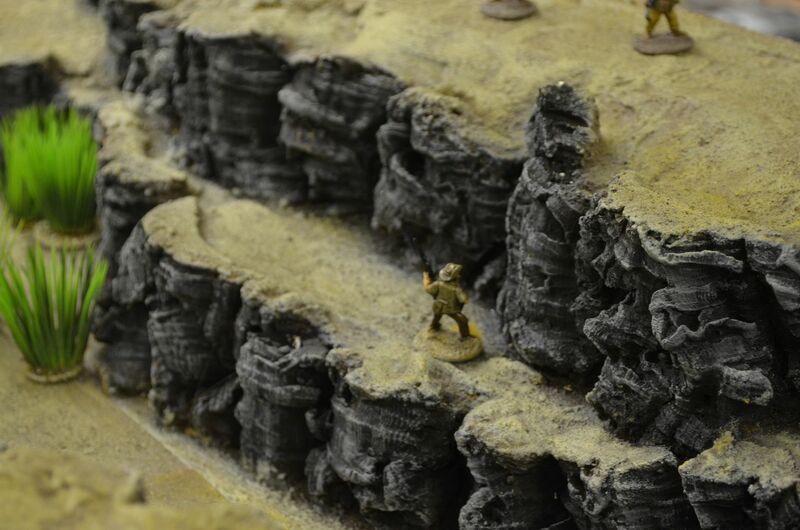 Thinking that the high ground over the camp might give him some advantage in this firefight Major Gruntz sent his sidekick Herr Piece up into the rocks with a couple of troopers. Several mounted Arabs poured out of the canyon and onto the desert floor and towards the camp. Positioning themselves just outside the camp they watched the firefight develop. Neither side seemed to worry about these late entrants. With confusion raging around Major Gruntz dashed into the camp and secured the missing rune piece from the local arab leader. 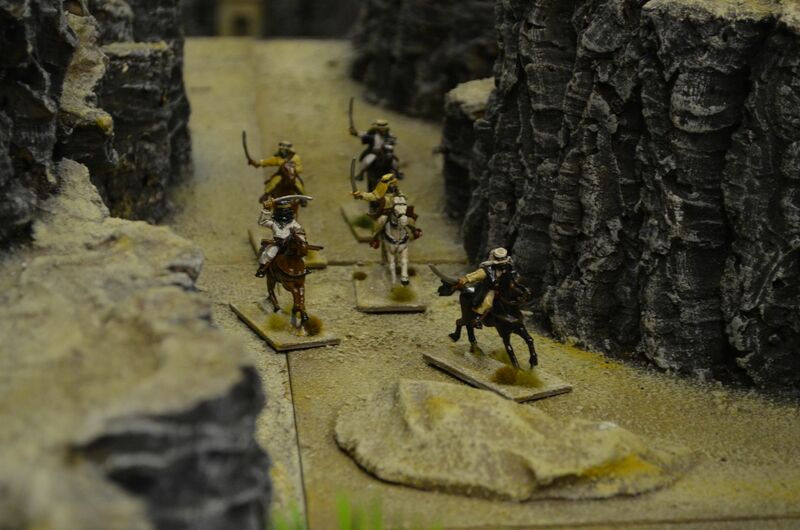 He was advised that any attempt to confront his mounted men would end badly...suffice to say both sides left my mounted Arabs alone and they played no part in the game save riding around the table and looking cool. 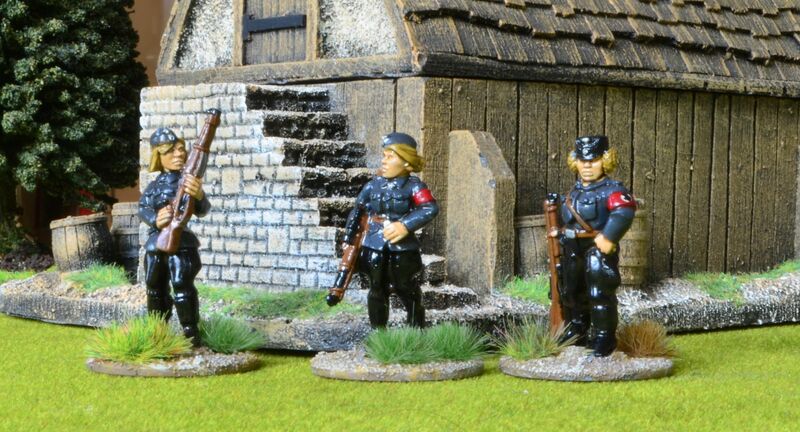 But he was too late - Major Gruntz had beaten him to it and under the cover of his remaining troopers he shot the old Arab in the head and siezed the fourth piece of the scales - The Nazis had won again..!! 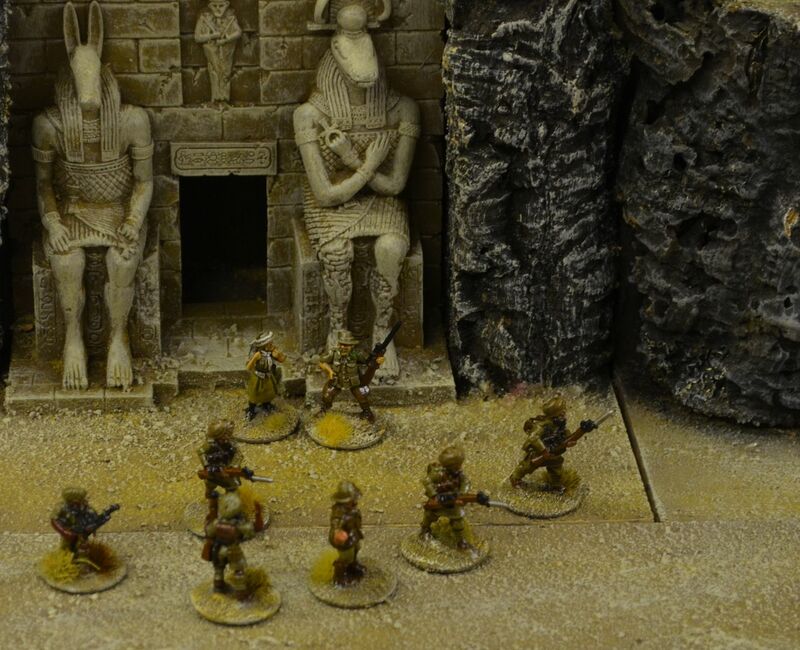 Last night saw the return of the Scales of Anubis Campaign to the shed, this was the first game played in over a month so it was good to get some of the guys around and throw some dice. A quick recap on where we have got to… The Nazi’s Order of the Black Sun have already secured two parts of the Scales of Anubis. 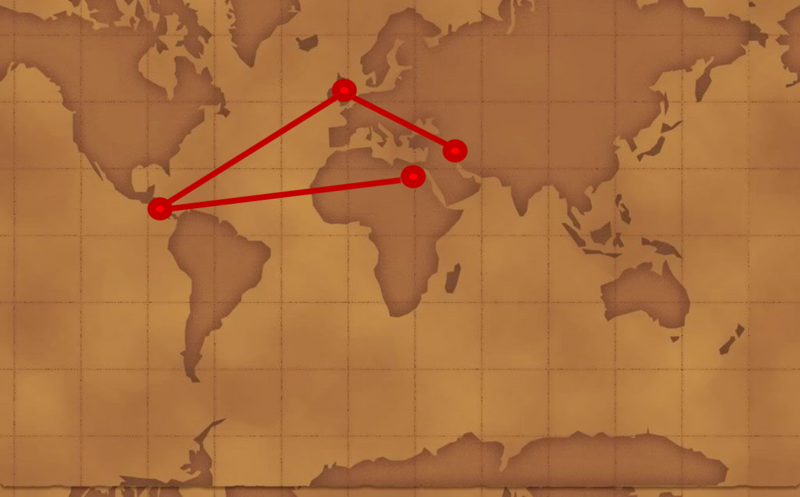 From the deserts of Egypt to the jungles of Central America these boys mean business. The latest episode sees the adventure move back across the Atlantic to the quiet County of Dorset in the south west of England. Before I kick off with the report just a few words on the game. 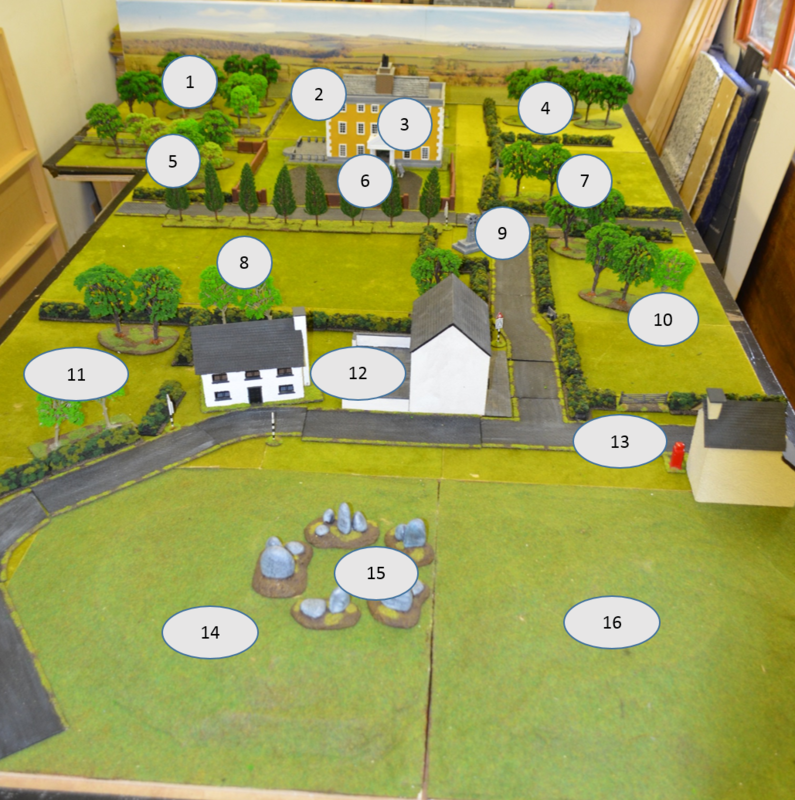 In the previous two games we had used the excellent Pulp Alley rules but in this game we returned to the more familiar territory of Bolt Action. 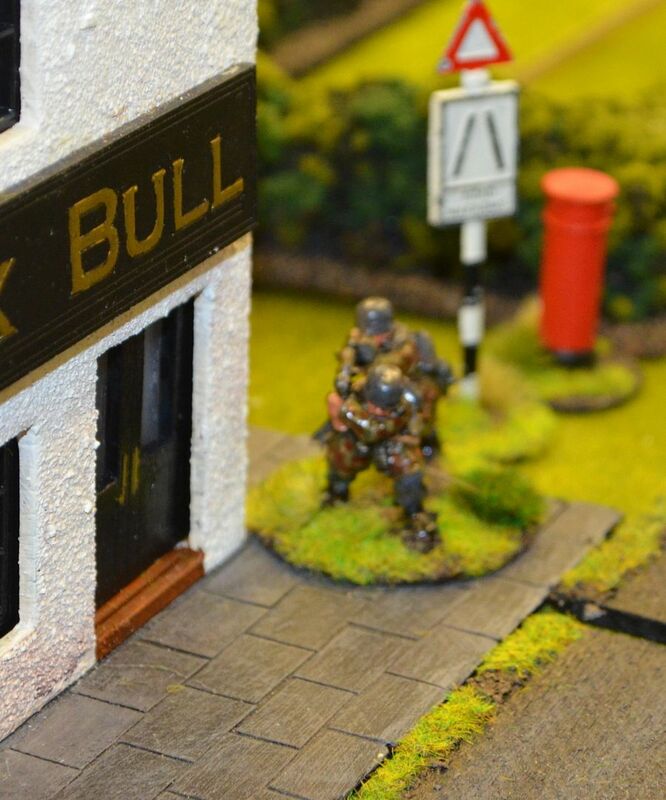 This was to be more of a ‘classic wargame’ , although it did have a certain pulpy feel. Its November 1936 and the Order of the Black Sun (Nazis) have determined through their research and the artefacts gathered so far that another piece of the Scales of Anubis could well be located in the ancient Egyptian collection housed in the English Manor house of Kingston Lacy. Although they had few clues to go they believed that a quick strike could potentially secure the Feather of Truth. Their mission was simple Find the Feather although it was complicated by the fact that no casualties could be left behind (the prospect of evidence of German Paratroopers on English Soil in 1936 was a prospect that not even the higher echelons of power in the Reichstag could sanction. The force consisted of the two officers and six squads of six men. 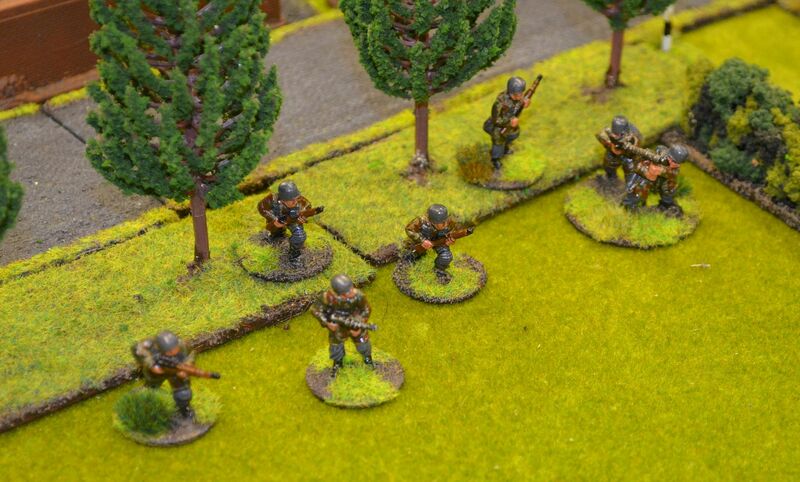 Each squad was typically armed with rifles & smgs. A total of 38 Fallschirmjager would parachute into England. 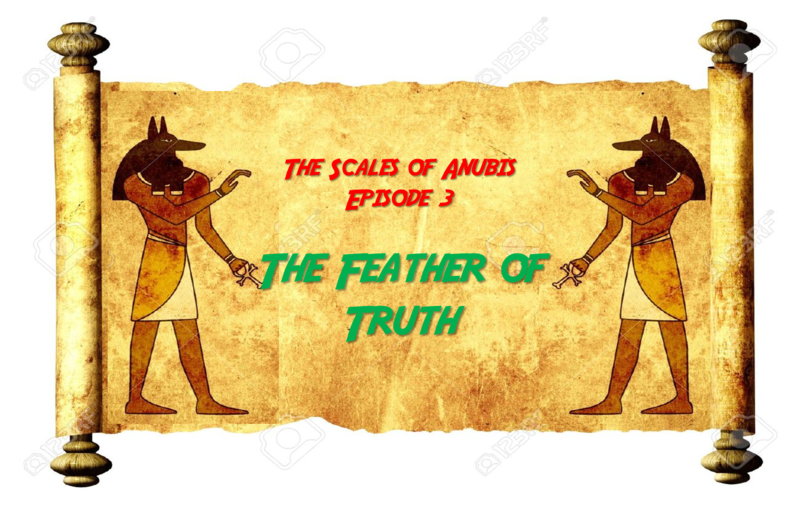 The Feather or Clues to its location may well be found in the manor house, there could be some evidence on the obelisk in the grounds, or could the feather be buried up on Badbury Rings? With three locations to aim for and little resistance expected, the force dropped into the West Country, in the early hours of a cold November morning. Unbeknownst to the Nazi planners was that their last minute secret plans had been intercepted and although these came through late in the day PITH Units from Salisbury were on their way to Kingston Lacy. Two squads of heavily armed agents were only minutes from Kingston Lacy when the Germans landed. Additional support would be offered by a unit of Land Defence Volunteers (think Dads Army) on training manuevers on the estate. Finally PITH had contacted the Lord of the Manor Ralph Bankes (great grandson to the original Banks) and had alerted him to the threat. Supported by his armed gamekeepers this little bit of England was intent on giving Jerry a bloody nose. But what of the feather…well the current Ralph Bankes knew of its existence. It was buried by his grandfather almost a century ago on the summit of Badbury Rings. Its exact coordinates etched in hieroglyphics on the base plate of the obelisk standing tall in the garden. To interpret these runes would require the use of the old diary kept in the safe at the Manor. I took a picture of the table and copied this into PowerPoint onto which I marked the various Zones. Given it was night-time and that I did not want each of the teams to see what the opposition had in the way of forces each squad was moved using hidden movement. Only when the teams moved into the same zone would they be revealed. Common sense would determine the location of each unit – for example if they moved into a zone with a building it would be assumed that the unit would take cover inside the building. Should a unit wish to stay still it was automatically assumed to be in Ambush mode. Being a relatively small board the hidden movement only lasted a couple of turns and all the forces were on the table. Should point out there were no AFV’s or indirect fire weapons. Well sure enough the Germans made a beeline for both the manor house and Badbury Rings. The Germans in England in 1936 !!! 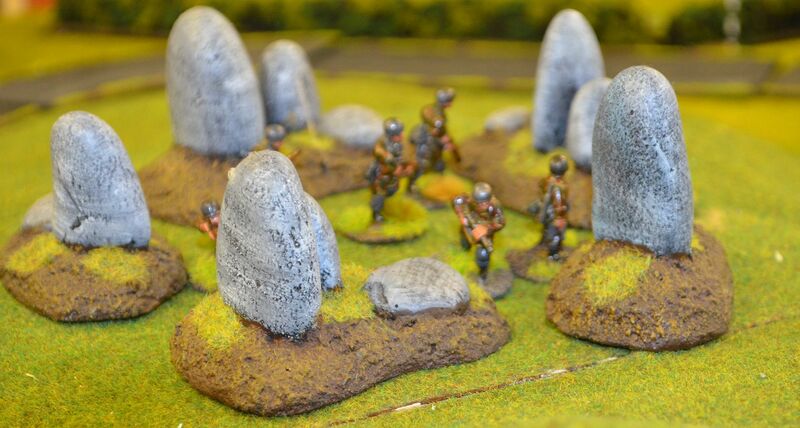 The latter was quickly climbed and a unit of Fallschirmjager dug in amongst the standing stones. 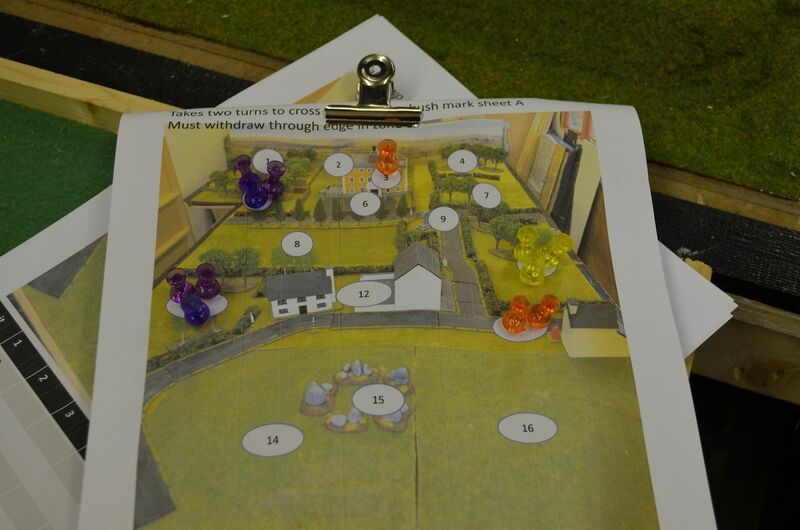 Meanwhile the first squad s approached the manor house with caution. 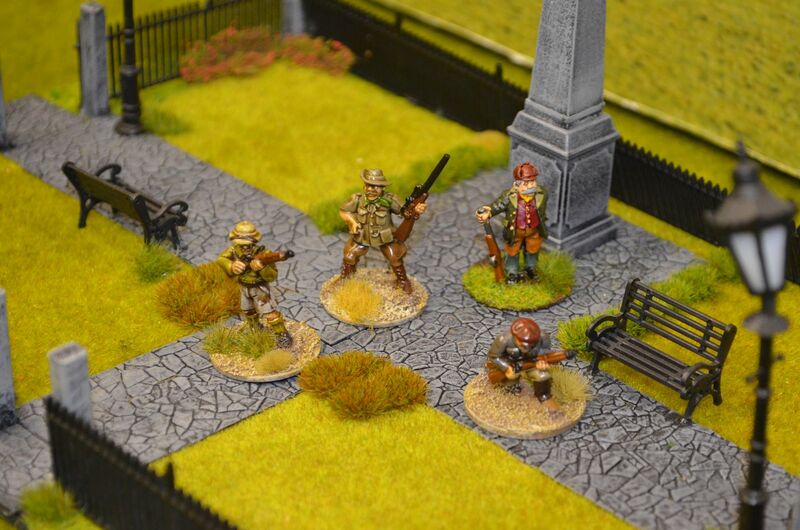 They soon saw off Ralph Bankes and his gamekeepers from the obelisk gardens and launched a full frontal assault on the Manor. 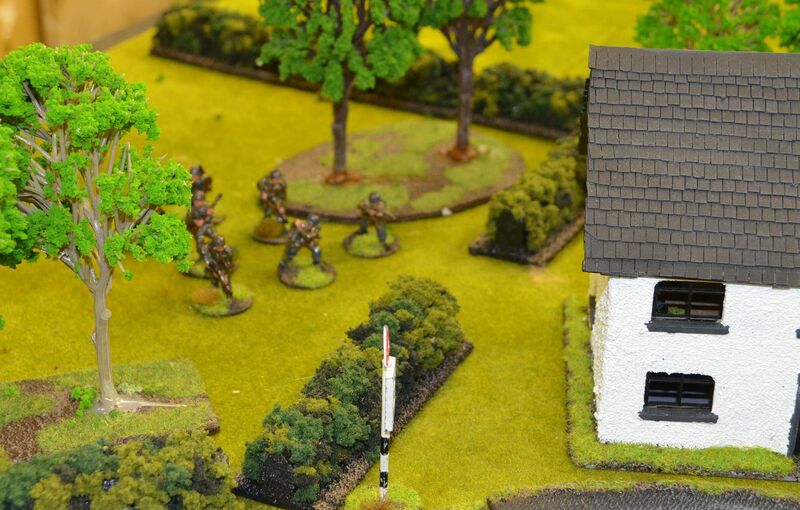 A turn later the Paratroopers had captured the building and soon were rummaging through the contents of the house. The safe was quickly discovered and pried open. With the clues in hand they could radio through the codes to the translators off table. A couple of turns later the Germans knew the Feather was up in the standing stones and its precise location. 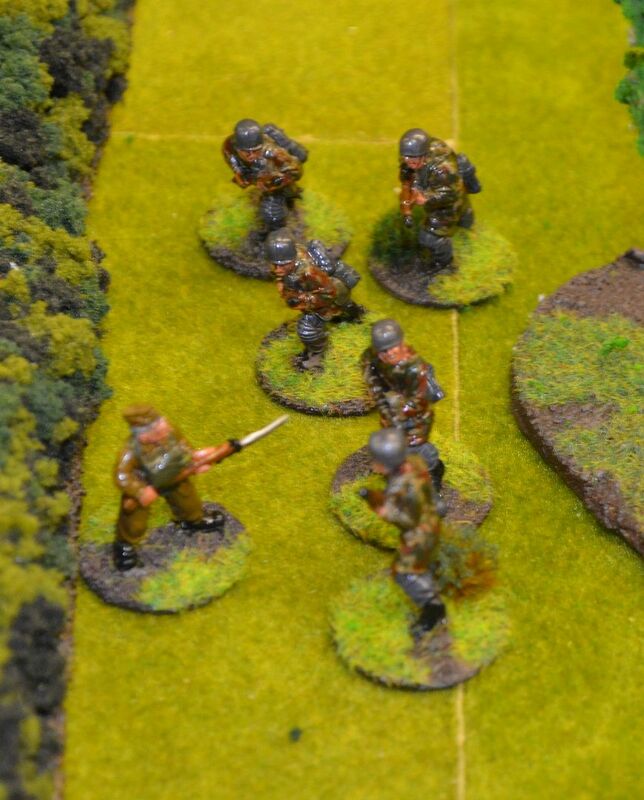 However things weren’t going so well for the Fallschirmjager up in the stones. Accurate fire from Pith agents began to drop these elite troops – it was looking like a charnel house. 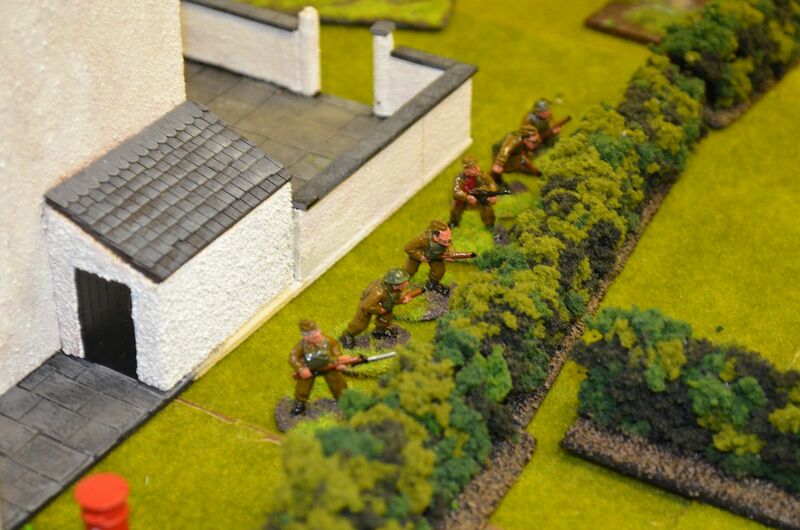 The other squads in the area were just too far back from the action to offer supporting fire. But it was getting lighter (ranges could get longer). By now the good Captain of the LDV had got his men up and moving. He decided to dash for the nearest phonebox and call the manor to see what all the fuss was about. 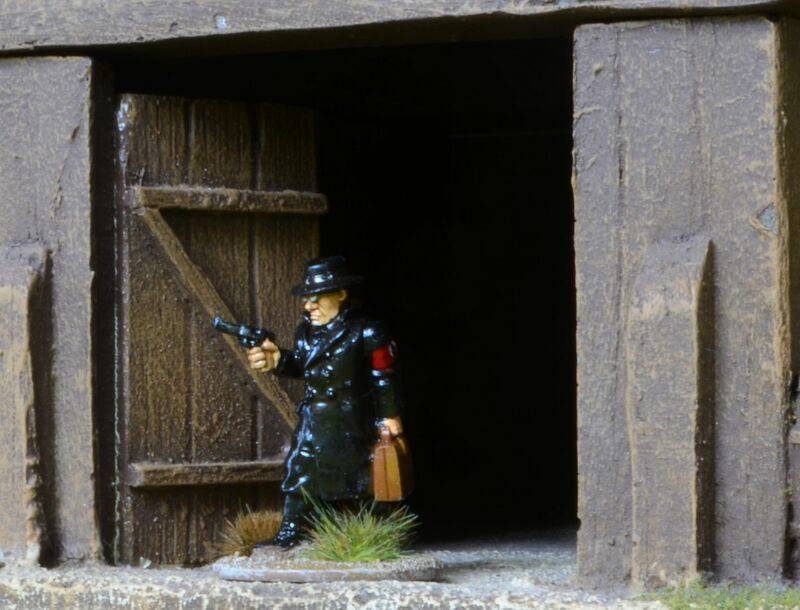 (the player controlling the LDV was not briefed on the purpose of the raid and could only surmise that hostiles were in the area – he could only receive a full briefing if he spoke to either Ralph Banks or one of the PITH agents) – he dialled the number and imagine his surprise when the voice answered on the other end ‘Ja’…. 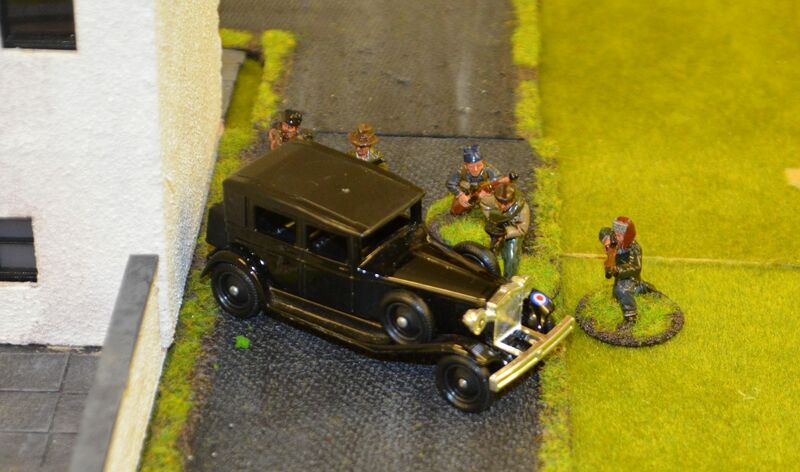 by now Ralph and his followers had expedited their way out of the gardens and bumbled into the good LDV captain. 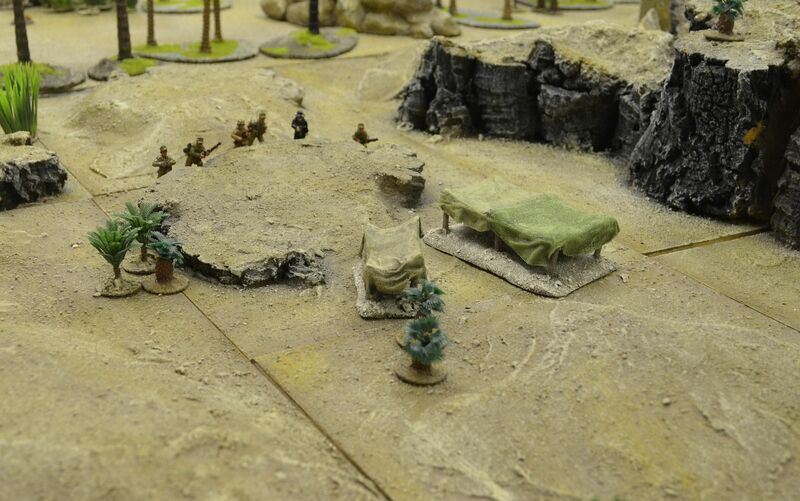 Things were getting worse for the Germans up at the rings – the stones were now being swarmed by MG toting Pith agents and further fire support was coming from the LDV who had taken up position in the pub. 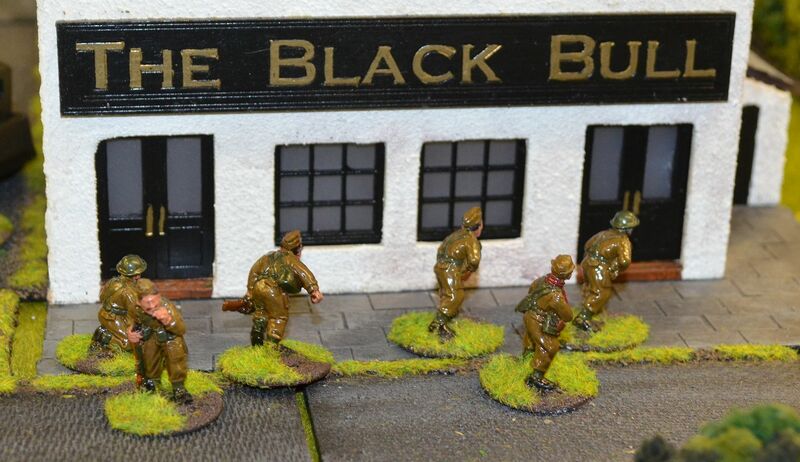 The Pub is a good place to defend...last orders ! 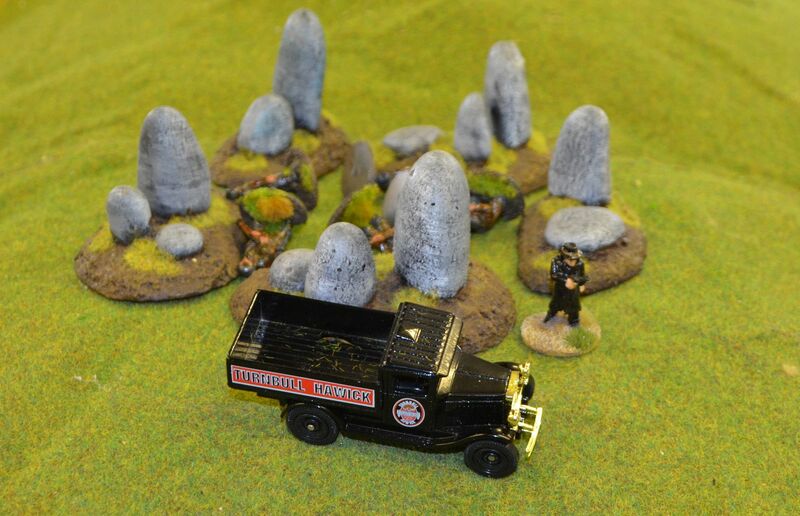 Major Gruntz was starting to worry as he began to start collecting up his fallen comrades and dragged them into a captured van. 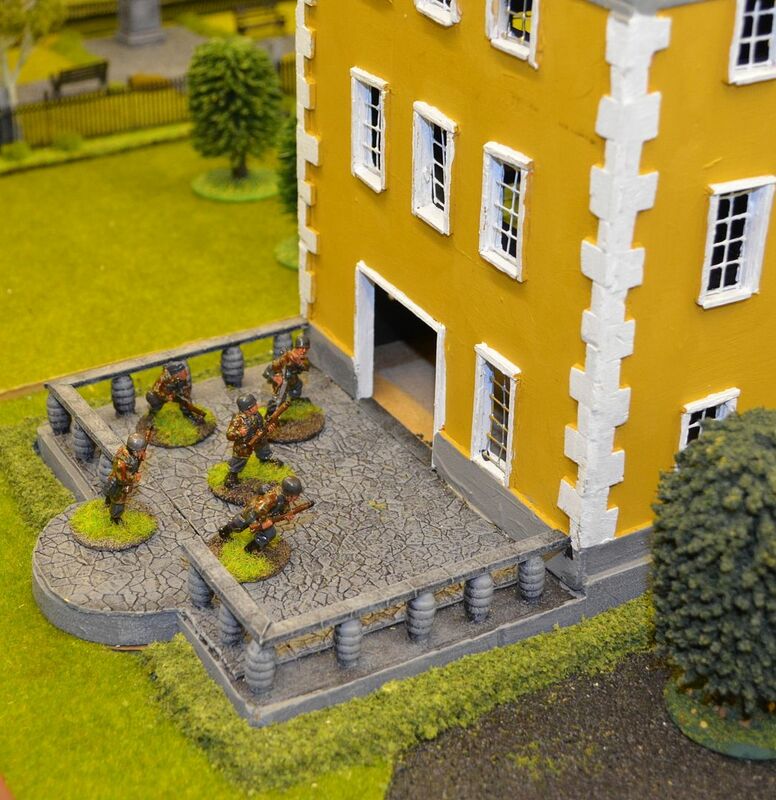 Could Kapitan Vier and his forces in the Manor render assistance. 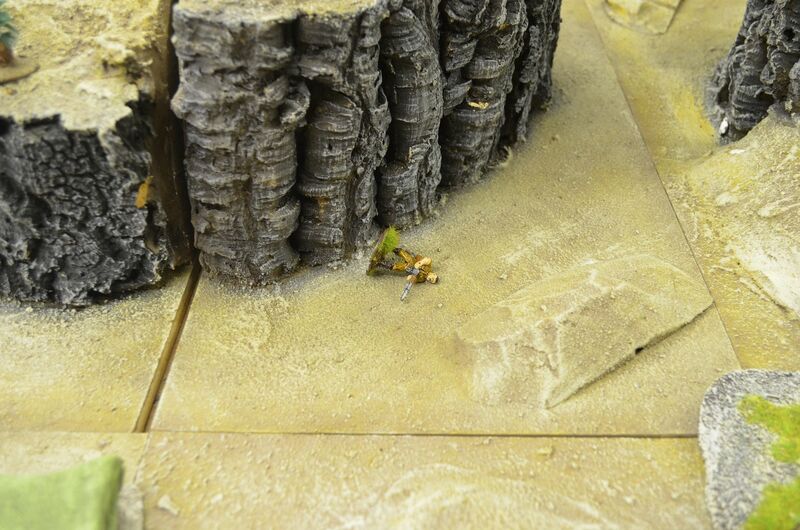 Three heavily armed squads began to traverse the table towards the rings. 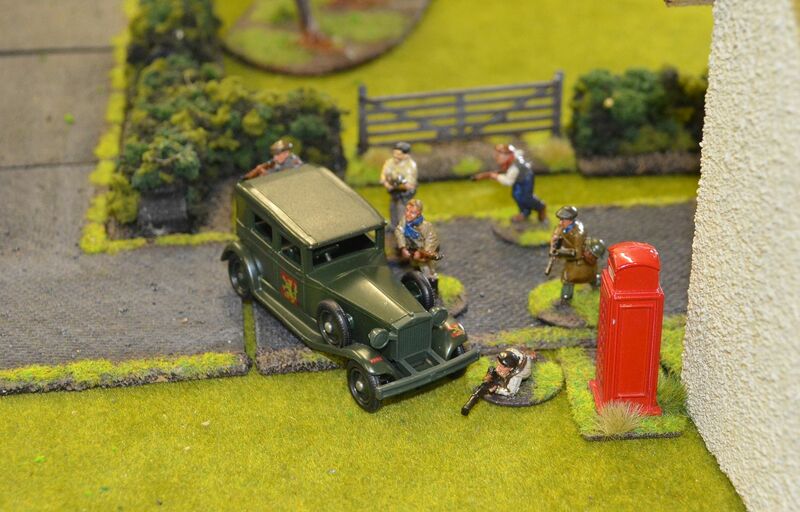 This was proving a most fluid game as these forces came under fire from Banks and the LDV hidden in the hedgerows. 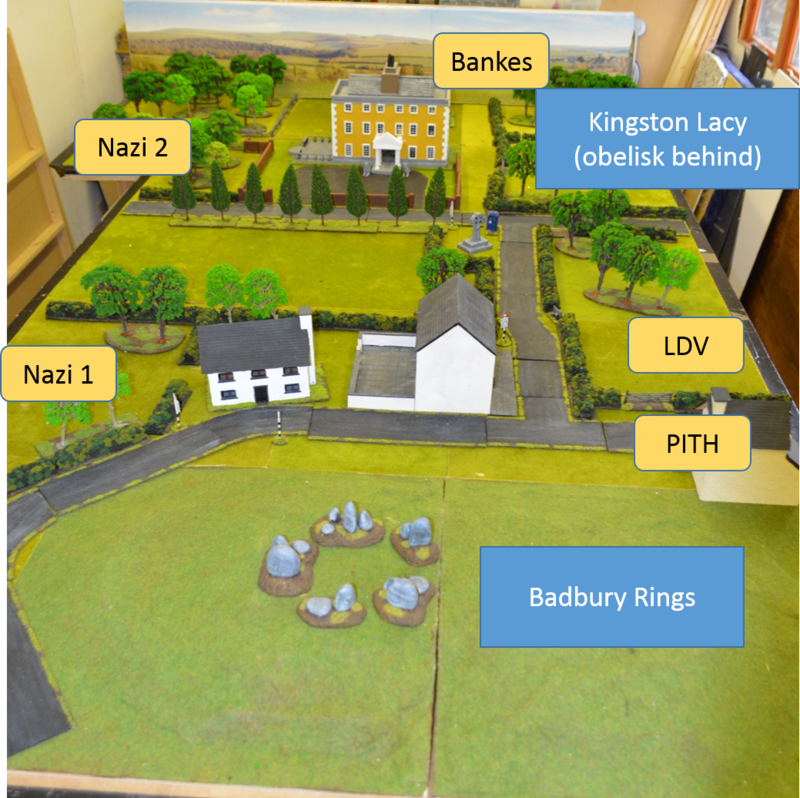 German rifle fire and morale proved better..as they pushed forward (albeit with heavy casualties). 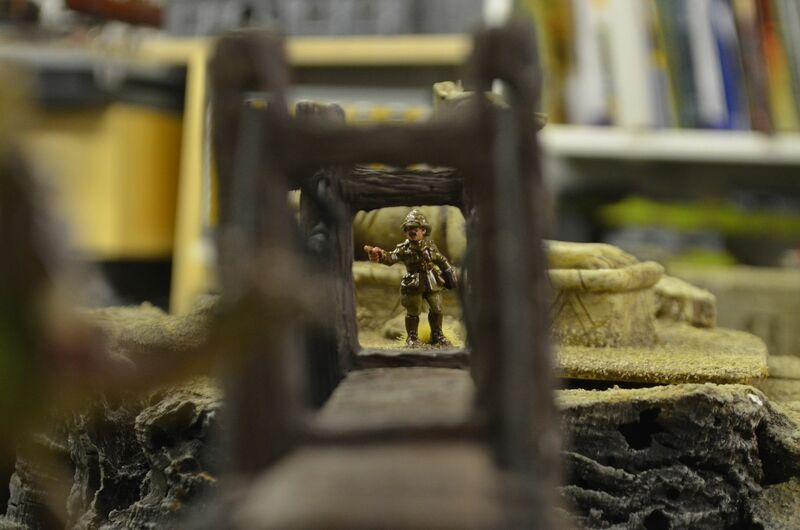 Corporal Jones section was all that remained of the LDV…these came under fire from. Five of the squad dropped leaving Jones on his own. 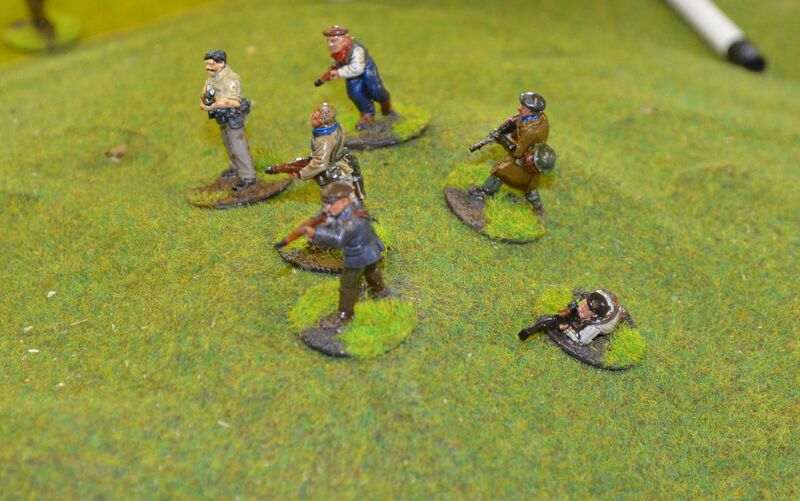 Seized with anger Jones rushed the Nazis with his cold steel…(a bitter hand to hand fight ensued) – Jones only just losing out to five heavily armed Boche. These reinforcements soon managed to mop up the Pith agents – the field was clear and the feather in the hand of the Nazis. 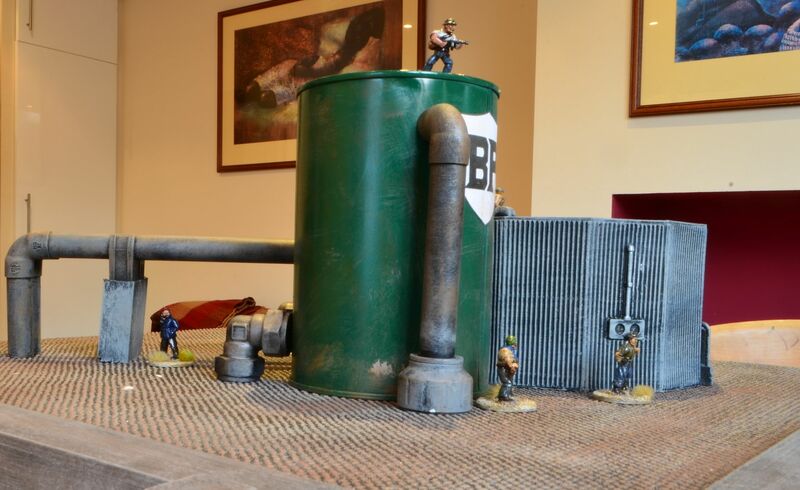 28mm Pulp Tramp Steamer - Project Finished ! 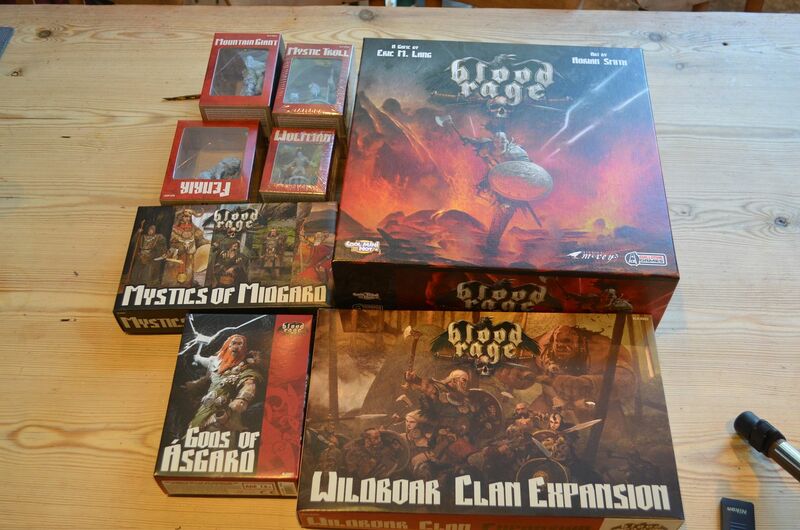 Wargamers Bloggers Quarterly - In it again ! !